I expect dog toys to last WEEKS at the very least. Not days, not minutes and NOT seconds! Right? Follow my advice and you will get your money’s worth out of dog toys from now on. Your dog may be a ruthless chewer, but there is no reason your dog’s toys should bite the dust in no time flat. 1. You could be in denial that your dog is a chewmeister. Once your dog has chewed up one toy with fanatical glee, chances are you’ve got a chewmeister. Take a moment and mourn. Now move on. You cannot buy this dog just any toy and expect a miracle. 2. You may not expect any toy to last with your sabre-toothed maniac so you buy anything – cheaper the better. Purchasing cheap toys won’t save money in the long rung. And it can be a dangerous gamble as your dog may ingest some damaging or toxic toy bits. (Read my article about BPA & Phthalates found in dog toys for some more insight) And, you’ll have to clean up HEAPS of endless messes. Salt in the wound. 3. The toy manufacturer oversells a toy’s durability. You are well aware of your dog’s radical toy tendencies and you try your best to keep your mate safe, but the toys just don’t live up to their marketing. Don’t worry. Help is on the way! I can & will promise you a REFUND on any toy in this post which does not live up its reputation. 1) AUSSIE DOG : the toys by this Australian company were developed for use with lions, tigers & bears. In a duel against your dog, my bet is on the toys. These 3 come with time warranties for your protection. a) Staffy Ball : a mighty ball that cannot be crushed by even a lion’s jaws. 24 cm diameter. Comes with a 12 Month Warranty. b) Tucker Ball : randomly releases treats or kibble to keep your dog enticed and entertained. Comes in 3 sizes with a 6 Month Warranty. 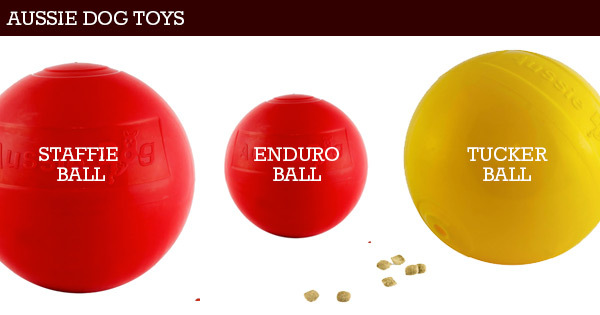 c) Enduro Ball : made from thick and durable solid plastic with an internal rattle. Comes in 3 sizes with a 12 Month Warranty. 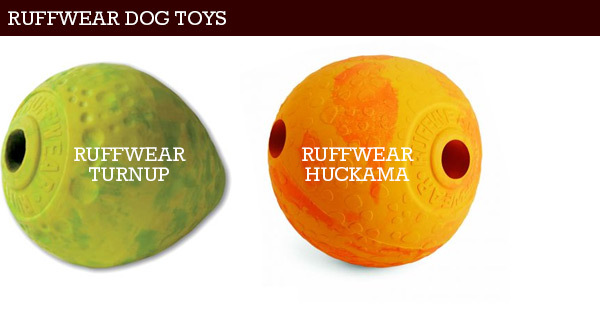 2) RUFFWEAR : I’ve NEVER had even 1 complaint about the durability of these natural latex toys in 7 years. That is an unbeatable record! They are an absolute fave with my dog Pluto. a) TurnUp : sized to fit dogs’ mouths and compatible with ball throwers. It is almost round so it bounces in all directions – ideal for athletic dogs of any size. b) Huckama : hollow design can stash food for treat rewards and whistles when hurled through the air. 3) WEST PAW : most chewers make no headway in this range. If you run into any issues you can just email me in a picture and I will get you a refund or exchange immediately. a) Jive : West Paw’s most durable dog ball yet. It bounces, it floats, it’s chewable & non-toxic. b) Hurley : super tough bone shaped dog toy that contains all the fun of a ball, bone and stick in one dog toy. c) Tux : a treat stuffable toy that is guaranteed durable, non-toxic and conveniently dishwasher safe. Buy any of these toys from us at Waggle.com.au and be pleasantly surprised by their longevity! Encounter any issues at all I will personally see to it that you are refunded in a FLASH without any HASSLE! That’s my promise to you. And my word is good. May 19, 2015 | Filed under Living With Dogs, Sports, Uncategorized.